The Comedy News: HE'S BACK! 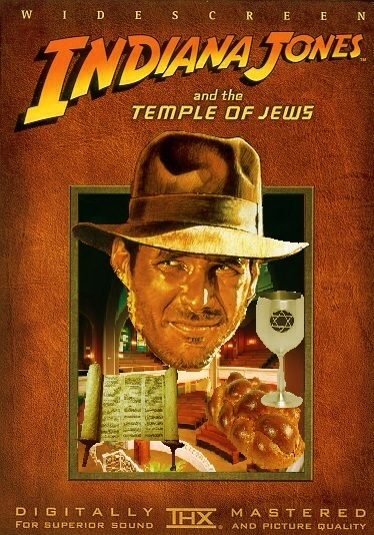 : "Indiana Jones and the Temple of Jews"
HE'S BACK! 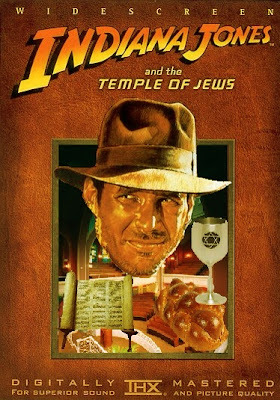 : "Indiana Jones and the Temple of Jews"
The fifth installment of Indiana Jones opens with a Passover seder at a South Florida retirement community in 1960. Dr. Jones has been a resident here since becoming an archaeology professor emeritus at Princeton three years prior. The retirement community staff organize an affikomen for the residents, which results in an action-packed cafeteria fight. Indy reigns triumphant after neutralizing fellow curmudgeons, and locating the hidden matzah under a chess table. Still, the offending residents are sent to the Temple of Jews, located in Key West, to undergo spiritual healing. Rogue real-estate developer Donald Sorrentino receives intelligence that the Temple of Jews sits on top of the coveted Fountain of Youth, once sought by Spanish explorer Juan Ponce De León. Meanwhile, all of the congregants at the Temple of Jews seem young in mind, body, and spirit, further confirming Sorrentino's suspicions. And as Indy and his fellow retirees start to embrace the spiritual healing process, he discovers the Sorrentino's plan to buy-off city planners, plant Burmese pythons on the grounds, and demolish the Temple of Jews to turn the purported Fountain of Youth into a theme park. Indiana Jones dusts off his fedora and tears out what little hair he has left as he and his fellow congregants go to biblical lengths to stop Sorrentino from razing the Temple of Jews.